This is the Jedi Knight Ultratech you've been looking for! 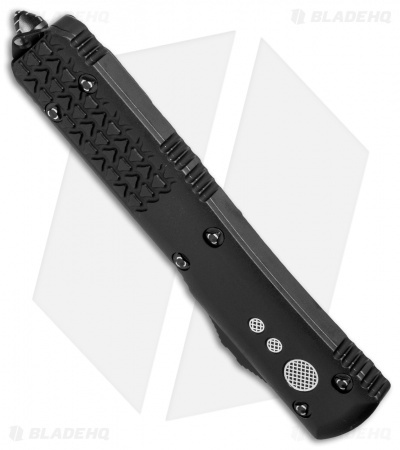 This exciting, collectible knife features a black light saber inspired aluminum handle. It has tri-grip texturing along the bottom and decorative light saber detailing. Fire out the blade to reveal a luminous blue finished blade worthy of any Jedi Knight. 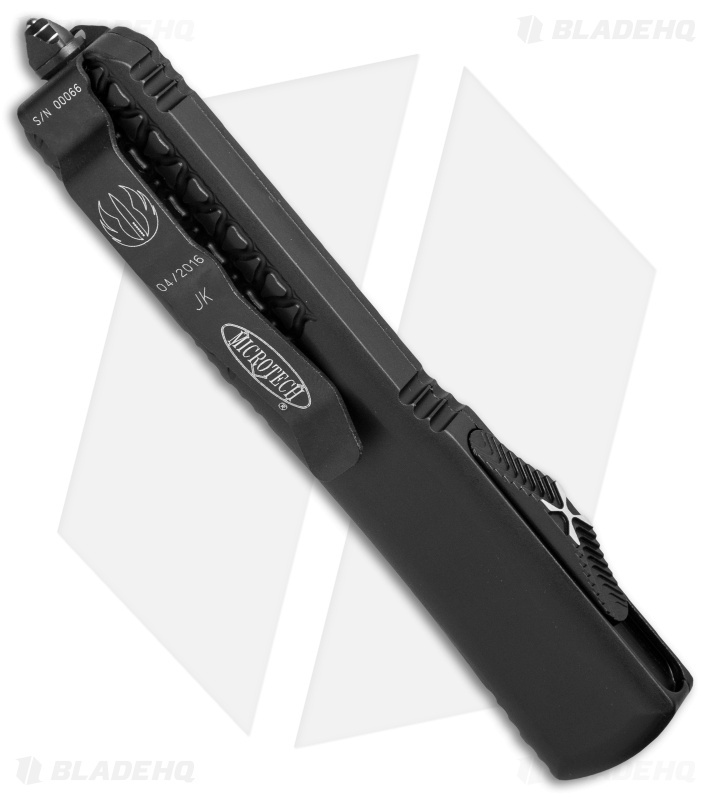 The pocket clip is marked with logos, serial number, and the date of production. 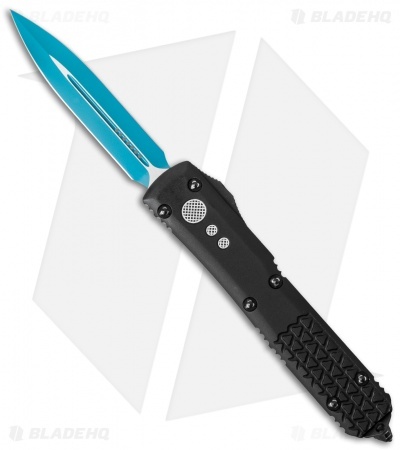 We expect these will go fast, so get your Jedi Ultratech before they're gone! This knife in in a league of it's own, OTF, and resembling a light saber. It's expensive but also well built, with quality from the knife tip to the glass beaker. Is the price justifiable, I thought so, you'll have to decide. This is a solidly built, extremely sharp and tight knife. It is finished to perfection and has a solid, secure feel in a class of its own. I can't even make it misfire. The knife is awsome and if you get one, it will be your favorite otf, even for edc. I am in knife heaven after getting this. I have to get the rest of their Star Wars Collection. This is a light saber morphed into an otf knife. I've had this knife for about a week now. I've not had anything to really compare it to, except an OTF Lightning, and that does not even register in terms of quality by comparison. I design tools and knives, I wanted to know what the Mircrotech hype was about. It's apparent when you actually get to handle a MT OTF, the lockup is so solid (much much better than the Lightning); I was worried all OTF's would be not much more than a gimmick because of how lackadaisical the Lightning is: it rattles when you walk etc. The actuator is a good pressure, you have to mean it, you won't be ejecting the blade by accident which is a great passive safety feature. The feel is just great too, they have made a piece of aluminum feel worth it's weight (of course the Elmax blade inside helps) the semi rounded edges of the handle are a very nice tactile addition. I also think the should make the triangular machined (what should I say, 2/5's length?) grip standard, as it makes it very easy to retrieve from your pocket, as the clip grips very hard, which I also like. Lastly, the blade is very well honed, you can't even touch your skin without it penetrating the outer layers, it's that sharp. Overall wonderful blade, my first otf set the standard (however poor) and this met all my quality expectations as I hoped it could. SUPER SHARP BLADE! THIS IS THE CLOSEST WE MIGHT GET TO HAVING A POCKET LIGHT SABER!!! NO REGRETS! I just received my Jedi Ultratech today. The pictures really don't do the knife justice. The black handle looks more like deep, rich purple in the right light. I'd had one Ultratech before this, the earlier model with the square frame and the flat trigger. This one has a much better action, and deploys without an ounce of resistance. I'm just happy I got one before they were sold out, if you can get one its worth every penny.